Tuesdays will remain a squat day for both fitness and advanced, but we will be moving to Front Squats to help with foundational movements like wall balls, thrusters and cleans. We will also be working in some supplemental midline strength such as L-sits, Strict toes to bar, Hollow holds, etc. Notes: Advanced Athletes should start around 75-80%. The standard for the L-sit is perfectly locked out knees with pointy toes. It is ok to allow the feet to be at a downward angle. If you cannot hold this position for at least 10 seconds, perform a seated Leg raise for as long as possible. Try not to lean back if possible, but no matter what keep those legs locked out! 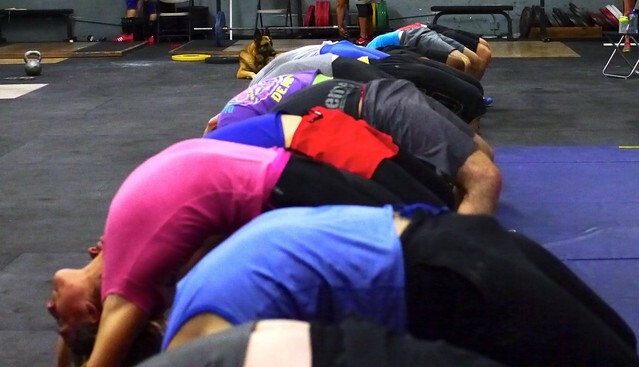 For the Squats, prioritize an upright torso and quality depth. Scale to back squats and/or use a box as needed and be sure to add in mobility drills in your warmup, cool down and active recovery days to improve this! Notes: Tabata is an interval protocol where you perform :20 of work followed by :10 of rest for 8 intervals (4 minutes). Score this workout as total reps performed. Standards for the shuttle runs are to touch both hands on the ground behind the line. Notes: Prescribed for the Knees to elbows is to touch your knees to your elbows!